Finch and Violet meet at the top of the school bell tower - each intending to jump. Rather than leaping to their deaths, however, they walk away. Depressed after the death of her sister, Violet broke into the bell tower in a moment of weakness. Now all she wants to do is forget the incident ever happened. Finch, wild, unpredictable, vibrant Finch, however, has other ideas. After the two are thrown together on a school project, Violet starts to warm up to this unpredictable boy and an unlikely friendship begins which soon turns into something more. But Finch has a secret he's hiding, he doesn't know how long he has until one of his dark moods drags him back under and these precious moments of clarity, of being awake, disappear. The publisher describes this book as a "heart-wrenching love story about a girl who learns to live from a boy who intends to die." That sounds pretty powerful, doesn't it? It is, but it also fails to encompass everything this book is about. 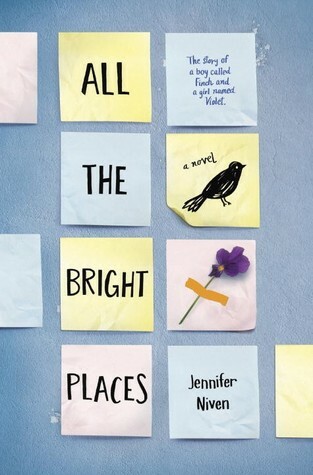 I've read too many reviews comparing All The Bright Places to John Green's The Fault In Our Stars, an understandable comparison considering the publisher is one of the ones making it. However, I think comparing the books is a disservice to AtBP. Niven tackles the issues of mental illness, suicide, first love, grief, loss and finding ourselves with such grace and beauty that she deserves to stand on her own merits. This book is a gorgeous narrative, an invitation to talk about something we rarely want to face: how pervasive and insidious mental illness can be. Finch is more than likely bi-polar, although he is never clinically diagnosed because, like many teens and adults, he refuses to admit he has a mental illness and won't visit a psychiatrist. Violet is almost certainly clinically depressed when the book opens. What is amazing about AtBP is that this book is both heartbreaking and uplifting at the same time. It's both hopeful and stark. There are no punches pulled and it's easy to get lost in the pages and the characters. This is a book that lingers in your mind and stays with you long after the final page has been turned. It's a book you can't help falling in love with, even as its tearing your heart out. Favorite quote: "We do not remember days, we remember moments." Recommended for fans of Forgive Me, Leonard Peacock by Matthew Quick and The Fault in Our Stars by John Green.